Kupinovo (Serbian Cyrillic: Купиново) is a village in Serbia. 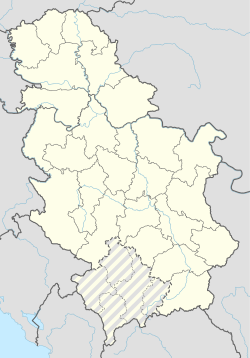 It is located in the Pećinci municipality, in Syrmia District, Vojvodina province. In 2002, the population of the village numbered 2,047 people, of whom 1,852 were ethnic Serbs. It is near the famous biodiversity area, the Obedska bara. This contains several insects and other life forms unique to the area. In Serbian, the village is known as Kupinovo (Купиново), formerly also Kupinik (Serbian Cyrillic: Купиник); in Croatian as Kupinovo; and in Hungarian as Kölpény or Kelpény. The name of the village derived from Serbian word "kupina" ("blackberry" in English). In the Middle Ages, Kupinik was a notable city and was a residence of Serbian despots in Syrmia in the 15th and 16th century. Miki Đuričić, contestant of Serbian "Big Brother" serial. It was the residence of the notable Serbian noble family, the Stratimirović (Стратимировић). Wikimedia Commons has media related to Kupinovo. This page was last edited on 5 August 2017, at 20:03 (UTC).